Sounds like a fabulous feast! Wish I could have been there. I did a bit of foraging yesterday as well: the red clover I blogged about, nettles, mint, some dandelion in the shade that hadn't bloomed yet. That wild onion haul you got is impressive! It was glorious and we thought of you. I love the Jack-in-the-pulpits - I never thought of them as a cut flower (greedy as I am for those red berries to brighten my late season)... Let me know how long they last! 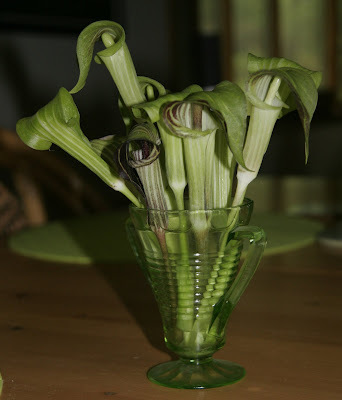 The Solomon's Seal cut stems stayed beautiful in a vase for weeks. I love the flowers, too. Wish I had better flower arranging skills, but even just plopped in a glass they're gorgeous. I'll be back there Thursday night and I"ll let you know how they look. You did the day and the meal great justice! It was fun and quite delicious. I look forward to many more days in the wild in the coming months. Here's another great reason to protect and nurture wild lands. The leftover poke made a great omelet and I found the gently- boiled nettle greens absolutely delicious with a bit of butter! Ellen! This was so painful to read! The menu sounds fantastic, and I can imagine that there is "here" in every bite. 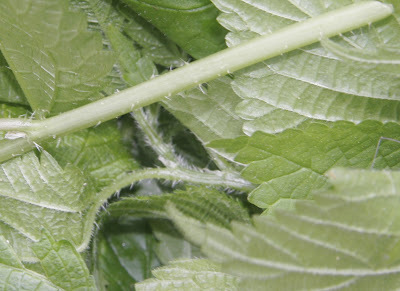 I would love your recipe for nettle gnocchi. I found some stinging nettles at the USQ GM last week, and knew that I wanted to do something similar, but was not quite ready for them. wow! good work! i am completely inspired. Oh Sophia, I didn't mean to cause you pain! And I'll definitely send you the nettle pasta recipe as soon as I get out to PA next weekend. And thanks for the compliment, Bonbon. Your jewelry is mighty inspiring, too! Heavens, I don't know why it took me so long to figure out that you have another blog...I'm dying here. I am a forager a heart. What a wonderful post.